It's people. Soylent Green is made out of people. Sequence editor Chuck Braverman, known for his flash-frame kinestasis montages/films, opens director Richard Fleischer's film adaptation of Soylent Green with images of the blossoming bourgeoisie. The pressures and plague of population are then conveyed with such sure-handed conviction that you perceive – we all perceive – just how easily the cookie crumbles. Main title designer CHUCK BRAVERMAN revisits his work on the opening title montage and discusses its creation. 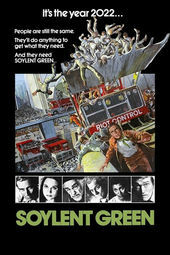 Can you talk a little about where you were in your career when you were asked to do the Soylent Green titles? I was actually working in the same building as him, at CBS as an assistant – really as a messenger – trying to get into the cameraman’s union in the news department. They literally made the Comedy Hour just upstairs. I called, made a meeting, and Tommy looked at my other work and we discussed doing a film on the history of the United States – American Time Capsule. I made it and it aired on the weekend before the November ’68 election and it was a huge hit. It catapulted me into a career. Not only did it appear on the Smothers’ Brothers Show, which was huge, but it appeared on The Tonight Show within a few weeks and then 60 Minutes picked it up. So I got a reputation right away for being the king of the fast-cut montage. I ended up doing dozens of commercials and lots of title sequences. How old were you in ’68? I was 24. So in 1973 I had done a bunch of montage title sequences for John Milius’ first film Dillinger. I ended up doing all of the montages in the sequence in Same Time Next Year. I did an award-winning commercial for Xerox about their new color Xerox machines. I was being hired by a lot of different companies to do this – it was called kinestasis, fast-cut montage – and I had a crew of people that worked with me. American Time Capsule was made with a couple of friends in a garage with a horizontal, homemade 16mm Beaulieu camera, one frame at a time, manually. But then we moved onto the Oxberry animation stand which I had learned to use at USC to make precise, calculated moves in stills. If you look at American Time Capsule carefully you will see I took the soundtrack to that and literally synced my cuts up to it – they vary from 12-frame cuts to 2-frame cuts depending on the drum beat. I did those fast-cut montages for many years. I loved doing it. How did you get involved with Richard Fleischer and the folks on Soylent Green? I think I was actually called by Walter Seltzer, who was a producer. I was pretty well known by then; New York ad agencies were calling fast-cut montages the "Braverman" technique. When I got the call from Walter Seltzer I went in and met with him and Richard Fleischer. They wanted to do an opening that was a history of the world. I went and did all the research, got the stills, and we talked about what it was gonna be. I brought in Betty Green who was a filmmaker friend of mine, the wife of a schoolmate, Bruce Green. As I recall, Betty and I worked on the animation. I did most of the research to get the stills, hired a stock agency, and then I don't remember who did the music... probably whoever did the music for the movie did the track first, because I like to have the music first. I like to cut to the music – I always felt that it was important. This one was sort of a hybrid, oddball montage. What I liked to do in those days – and I did it a lot – is that I would put the music up on a Movieola or a K.E.M. and I would get or make an optical track and I'd watch the waveform of the optical track. Then, I would take a piece of blank leader in the K.E.M. or the Movieola – it was probably a Movieola, even though it was '73 – and I literally would make marks on the leader of where I wanted things to happen. Watching this again right now, you can see that it speeds up when the music speeds up, and slows down the when the music slows down. How did you approach the research and finding all of the photos? When you're working for an esteemed, experienced producer like Walter Seltzer and a very experienced director like Richard Fleischer, you go over and have meetings at the studio, which was then MGM, now Sony, and you sit around talking about what exactly it is that they want. Then I went out and got a bunch of stills before I put anything on camera, and I came in and showed them all the stills so there weren't going to be any surprises for them. They paid for whatever the stills cost. Then it was shot on an Oxberry animation stand. Just like flying on a trapeze: it's easy for the trapeze artist, but when you're doing it for the first time, you have to know quite a few intricacies. Creating photo montages before the advent of digital technology must have been incredibly laborious work. Could you describe your process? All this now would be done digitally in After Effects, right? The Oxberry is basically a 35mm – they make it in 16mm too – but we shot almost all this stuff in 35mm because it didn't cost much more for title sequences. It's like a motion picture camera on a stand pointing down at a table, in essence, and the camera moves vertically on the stand. There are lights on either side. If you’ve ever seen how Walt Disney made animated films, it’s exactly the same on an Oxberry animation stand, but in this case, instead of moving on cells, we would move on stills that were on a pegboard. So each photo or still was mounted on a blank cell so you had a spatial reference – you’d know that this point in the picture is the center, for example. If you want to start in the upper left hand corner, then go close up on a building in the background, and pull out to reveal the whole city or crowd or whatever, you literally control the table underneath the camera – you have north, south, east, west directions that the table is controlling. You have vertical directions, so you have field number 12, say a 12-field is the entire picture or a 16-field – whatever lens you have on – so you can go from a 1-field, north-east to a 12-field center and x number of frames. So it's a frame-by-time process. Yup. One frame at a time, 24 frames a second. If you want a move to take one second, you have to do a calculation to know how much you move the camera vertically to get from field one, which is a close-up, to field 12 in 24 frames. So that’s an easy one. So you shoot each photograph separately and then edit them together? Well, yes and no. You shoot each frame individually, but if you have calculated and done everything right, you have very little editing to do afterwards. Right. You know where you are in the film so you’ve got that one photograph, you swap it after the next photograph and you can continue with that move. Yes, and most of the time it works out just fine. Sometimes you have to make adjustments and make something longer or shorter. But you know, with American Time Capsule people would say to me – and there were 1,300 cuts in the film – “My God, how did you make those physical cuts – on film with a splicer?” Well, I didn’t! It was in-camera, for the most part. There will probably be only four or five cuts in the whole thing, and the Soylent Green title sequence is the same. All of it was pretty much built into the camera, there was little, if any, actual editing after the fact because it was all done when we were laying out the shooting for the Oxberry animation stand. And it’s the same with all the split screen stuff – you're just revealing part of the next frame? Yes, it looks easy. Just like flying on a trapeze: it's easy for the trapeze artist, but when you're doing it for the first time, you have to know quite a few intricacies. It can get complicated; you wouldn’t go from field one to 12 in 24 frames. You have to ease in and out of these moves so they’re not hard – they should be soft landings coming in and out. It almost sounds easier to do it this way than to do it in After Effects because it's a physical thing versus all virtual. You have to do it blind, in a way. You make these L-frame things, so when you want to see one field, you put your two Ls together. Imagine putting your fingers and your thumbs together to make a small square – that’s a 1-frame. And if you make a bigger square, that’s a two and three, etc. You have to figure that out and get a little experience, but yes, once you know how to do it, it's not that difficult. Just like the trapeze. What was the working relationship with Director Richard Fleischer like? What sticks in my mind the most is having become friendly with him and being allowed to go in and watch dailies of what he was shooting. In 1973, I had very little experience on a real movie set. I had shot films at USC and I'd graduated from film school, but what you don’t know is what you don’t know. I was astonished at just how much film they shot to get one scene, how long it took. I was on the set one or two days, but when I would come in to show him what I had done in the screening room, they would let me come in early and see the dailies. It was an eye-opener for me. In terms of my relationship with Richard, he was very friendly, very open, very giving, very nice but very business-like. You know, this wasn’t a game, this was important to them, obviously, and it was important to me, too. I wanted to impress them. I had a production company going; in 1973, I probably had eight or nine full-time employees in the office up on Sunset Boulevard. I was about 28 years old. How long did the sequence take to create, all in all? The longest part was the research phase, which probably took me six weeks. Then, putting it into the sequence with Betty probably took a couple of weeks. Once they’d looked at all the stills and approved everything and their legal department gave the okay, that probably took another couple of weeks. A little over two months, I suppose. And what attracted you to the Soylent Green project in the first place? It’s a big motion picture! You know, working with Richard Fleischer, MGM... it wasn’t really a difficult decision. It's something I had done a few times already and it was an honor. I was thrilled to be working on this movie. They weren’t taking a big risk on me, either. The idea of being able to hang out on the set and see Leigh Taylor Young and Charlton Heston and Edward G. Robinson – I think it was his last movie – it was exciting! It was film.